Because the unexpected should always be expected, you can be confident that with our wide range of health insurance plans that’s been created just for you, all medical expenses from illnesses, big or small, you will always be protected. Health Insurance - Choose the one that’s right for you. Our health insurance makes planning your future a walk in the park. Our Star Health plan can give you the best coverage, answering to all your needs whether you are a Thai or a foreigner. The Star Health Plans are well suited for both Thai Nationals and Foreign Nationals, as long as Thailand is your main country of residence. We accept new entries up to 65 years of age, and if you join the Star Health before you turn 61 years old, we offer you a Lifetime Renewal Guarantee. Our Starhealth Insurance has 6 different types from plans: 1 STAR to 6 STAR. The Star Health Plans offer comprehensive in-patient cover at 6 different levels, from Star 1 to Star 6, plus two out-patient options per level. Coverage also includes Emergency out-patient treatment, preventive check-up cover, dental cover, rooming in cover, plus assistance worldwide, 24/7 (for up to 30 days per trip). For more information see below or simply click "download" so you can keep the information for later. The Star Health plans cover in-patient treatment as a basis cover, just select your desired level of coverage, from THB150,000 per disability (Star 1) up to THB8,000,000 per disability (Star 6). Then select one of the two optional out-patient options available for each level. What do I have to do to get health insurance? It is easy and convenient to get a health insurance plan with us. When you are interested in getting health insurance, our representatives will contact you to recommend the plan most suitable for your needs. All you have to do is confirm the plan, you can also do it by phone and 15 days after the confirmation is received, you will get your insurance contract. How should I pay for the Insurance? Yearly or monthly? You can choose to pay premiums either Yearly or Monthly, whatever option best matches your requirements. On annual premium payment mode, you save interest and only need to make a single transaction per year. When I get a health insurance, will I get money back as a dividend during the year? Because Thaivivat’s health insurance falls under the miscellaneous category which means there’s no long term contract based on agreement, we don’t have a dividend policy. However, if you choose the ใจป้ำมีคืน health insurance and there’s no request for a forfeit during that year, there will be a 10% refund at the end of the year. How do I claim or use the insurance when needed? It is very convenient to use your insurance: Just go to any of the more than 300 hospitals in our provider network Nationwide and show your Care Card and a valid photo-ID. The hospital will then contact us to coordinate everything and you will not have to pay for any of the cost covered by the insurance. Truly “Cashless” service. Do I get a Care Card with my health insurance? All health insurance comes with a Care Card for all of our customers’ convenience. The card can be used at the hospital based on your contract. We also have a Thaivivat credit card which can pay for all your medical expenses in all hospitals and clinics. What privileges do I have with the health insurance in terms of hospital care? 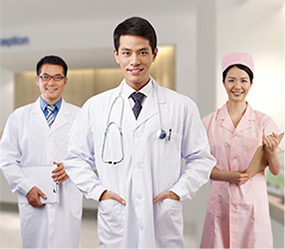 Besides offering access to one of the largest provider networks in Thailand, Thaivivat’s Star Health plans also offer Emergency Medical Assistance Worldwide (as well as Nationwide in Thailand), Rooming in cover for parents to stay with their child, plus cash plan benefits and preventive health check cover, and much more. At what age can I get a health insurance? You can enroll in our Star Health plans from 15 days old, and remain covered for life! Maximum entry age is limited to 65 years old. Do I have to get a medical check up if i am interested in your health insurance policy? No need, all you have to do is fill out our application form. Can I use health insurance for tax deductions? If I have a pre-existing condition concerning my health, can I still get health insurance? Depending on the seriousness of your pre-existing condition(s), we will try our best to find a suitable solution for you, but in principle, we will need to exclude pre-existing conditions. If I would like to buy health insurance, how do I do it? Just get in touch with us by phone or email. No one wants to get sick, but sometimes these things happen. All you need is the health insurance credit card from Thaivivat to cover all your expenses. You can use it right away at all the healthcare providers in our network. Better yet, if you don’t claim it, you can get it right back into your pocket. For those that care about their health, this coverage plan insures persons from 21 years of age up until 60 years of age and can be extended up at 75 years of age. - Including the medical expenses for continuous out-patient care up to 30 days after leaving the hospital. Actual Exp. Actual Exp. Actual Exp. Actual Exp. If you don’t claim it, you can get it right back with the health insurance credit card, no need to pay anything first at all the hospitals. For every year that you don’t make a claim, you can receive 10% of the service cost back no matter if you extend your coverage plan or not. You can receive coverage for sickness and accidents all over the globe, except the United States and Canada. You can receive up to 700,000 THB per year in medical expenses. You can receive coverage for out-patient care up to 30 times a year. The cost of service can be paid in instalments. Thaivivat Insurance would like to recommend the “ใจป้ำ มีคืน” plan which provides coverage for both health issues and accidents that may occur unexpectedly. This covers both in-patient and out-patient treatments. You can also add on to the coverage in case of accidents to cover all your medical expenses. How should I pay for the cost of service? Yearly or monthly? You can choose to pay both yearly or monthly. If you choose to pay yearly, you no longer have to worry about the interest rates and you will receive coverage all-year round, uninterrupted. If you choose monthly, you will have to make a payment that’s been divided from your yearly rate. It’s very convenient to forfeit as all you have to do is hand in your Care Card with your identification card to the hospital that’s in your contract which there are 311 hospitals at your convenience without having to pay anything. Thaivivat’s credit card can also pay for all your medical expenses at all hospitals and clinics, no cash required. We have 311 hospitals in our network where your privileges are completely valid and can be used. You can search for your most convenient hospital at www.thaivivat.co.th or just show your Care Card with your identification card. Furthermore, you can also use the health insurance credit card to pay for all your medical expenses at all hospitals and clinics most convenient to you. Our health insurance policy is provided for persons between the age of 21-60 years old. If you have a pre-existing condition, Thaivivat would like to take your case for further consideration. We would gladly put one of our representatives to be in touch with you and discuss which plan is best suited for your needs. You can agree on a plan right away. Cancer is known to be the silent killer all over the world and in Thailand, it’s no different. Cancer takes away more than 60,000 lives each year in Thailand even when risks can be significantly lowered by staying away from smoking, stress and maintaining a healthy lifestyle. However, the risks are still there which means cancer is one of the things that shouldn’t be overlooked. Let Thevee Suk Cancer Insurance be the answer in lowering the damages caused by cancer when it comes to expenses. Whoever that feels like they are at risk of cancer. Even if you’ve been diagnosed, as long as you pay the full cost of service as soon as you are diagnosed, you can still be covered. Full coverage for all types of cancers. Service cost can be paid in instalments.